Guest blog: Partners in clubbing! 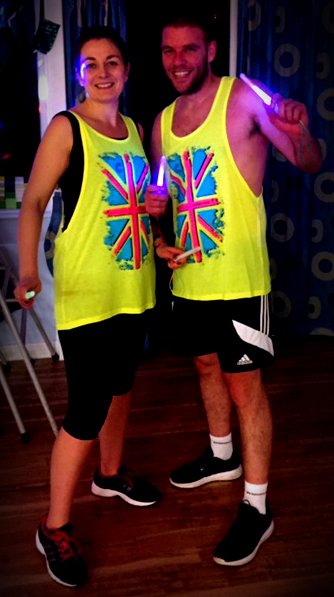 My wife a few years ago heard about Clubbercise in Nuneaton and decided to give it a go. Well two years later she has not looked back, she goes twice a week without fail. She lost 2 stone solely by going to Clubbercise and changing her diet (basically by cutting out junk food). I'm keen on being fit. I play football and am part of a circuit training group but struggle to get there all the time due to work commitments. One week I made a deal with my wife "you come to circuits with me and I’ll go to Clubbercise with you" and after completing my first Clubbercise class I was deeply surprised with the benefits. It was totally different to anything I have done before. Yeah ok the lights go out and you get the glow sticks out but this is just the fun part. For fat burning, cardio and intensity this is right up there! All blokes should try this. To do something like this with a partner/wife is brilliant. Me and my wife have such a laugh and believe me when the lights go out and the music starts we give it 100% as we want to get the maximum out of it.